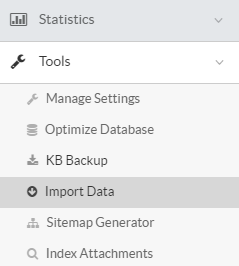 Superusers can use "HTML Import" module to import the HTML documents as articles in your knowledge base. It is an optional module available as a paid add-on to PHPKB knowledge base software. Refer instructions below to understand how this module works. Please keep into consideration that in ML editions of the software, articles will be imported into the language which is selected in language drop-down. For instance, the screenshot above depicts the scenario of ML edition where language selected is EN i.e. English. All the HTML files residing in import folder are displayed on the page, you can choose the files (which you want to import) by marking the corresponding check boxes. If you want to import all the files, click on Check All button and click on Uncheck All button deselect the files. Select article type i.e. public/private. Categories are displayed as per the article type option. If Public is checked, the public categories of the language selected in language drop-down are displayed else private categories are displayed. Select the categories under which you want to import the file(s) and then click on Start Import button to start the import process. The successfully imported files are saved as "Drafts" and imported HTML files are moved to "/assets/importcomplete" folder so that there is no chance of getting them imported again. Click on imported count (labelled in the screenshot above) to view or manage the imported articles so that you can verify them before publishing them in the knowledge base.